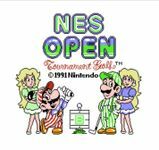 NES Open Tournament Golf is sports game featuring Mario as it's main playable character. There are three different playable courses, US, Japan, and UK. There are four different play options: Stroke Play, Match Play, Tournament, and Clubhouse.